15/06/2007 — Art Market — London, Sotheby’s — A Saint Rufina by Diego Velázquez (ill.) will be auctioned in early July in London. The work is already known since it was sold at Christie’s New York on January 29, 1999, where the present owner acquired it for $8.1 million. Nonetheless, the appearance of an authentic Velázquez on the market is always a rare event. Formerly attributed to Murillo, it is today acknowledged by the leading specialists, particularly Alfonso E. Pérez Sanchez. Only Jonathan Brown considers it possible that it might also be the work of one of Velázquez’s students, Juan Bautista Martínez del Mazo, who has only two known pieces. The painting is dated about 1629-1630 by Pérez Sanchez, and 1632-1634 by Peter Cherry, who compares it to A Sybil from around 1631, belonging to the Prado. It has also been pointed out as similar to the Lady with a fan (about 1635) at the Wallace Collection. Whatever the date, the artist painted it after having left Seville for Madrid, even if the subject suggests that it might have been commissioned from someone in the Andalusian city. Rufina, along with her sister Justa, is the patron saint of Seville. Both martyrs, Rufina was decapitated for having refused to honor a picture of Venus. The bowl in her hands is worthy of the still-lifes painted in Velázquez’s early years. We should remember that the Museo de Bellas Artes in Seville owns only two paintings by Velázquez, one of them Head of an Apostle only recently acquired. 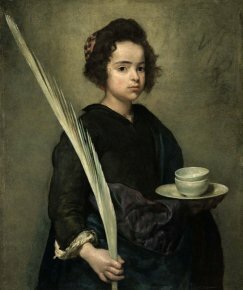 The association Velázquez para Sevilla, supported by the Friends of the Museum, has launched a drive to raise funds in order to purchase the painting. It seems almost hopeless given the price it is sure to reach (estimated at £6 to £8 million). They have turned to the government for help but Carmen Calvo, Minister of Cultural Affairs, stated that Spain would not attempt to acquire the painting for Seville, declaring that “you cannot do everything and an honest politician has to make choices”, emphasizing that she prefers to devote her budget to protecting the local heritage of the city (a museum extension, restoration of the Cathedral and of the Divino Salvador church,…).